The Husqvarna 5521P mower is exactly what you’d expect from a Husqvarna product — a well-engineered lawn tool constructed with enduring quality and guaranteed to get the job done time and time again. This is one of the best lawn mowers on the market. It doesn’t have any fancy bells and whistles but it’s built to last, easy to operate and navigate due to its streamlined design. The Husqvarna 5521p is a 3-in-1 lawn mower, which essentially means that it has a side discharge chute, it mulches, and also has a rear bag for collecting your grass clippings. 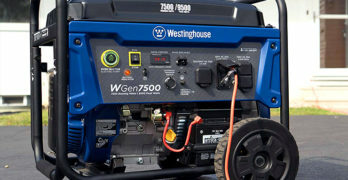 It has a 21″ cutting width and powered by a 140cc Briggs & Stratton engine. We live in an age where manufactures often over-complicate their products by adding useless features that add no real value, fortunately Husqvarna knows exactly what consumers need and their products are a testament to their commitment to creating finely crafted tools that stand the test of time. In case you didn’t already know, Husqvarna was founded in 1689. Yes — they’ve been around for over 300 years. They know what they’re doing. Folding handles for easy storage. Can be easily transported as well. The excellent Husqvarna 5521P has a 21″ cutting width and is suitable for small to medium-sized lawns. It’s the perfect size for most homeowners and yards. It comes with 8″ front wheels and 12″ rear wheels making is easy to weave around your yard. It’s easy to start with a convenient pull starter that’s located 1/2 way on the side of the handle (see diagram below). This is a solid push lawn mower but surprisingly easy to maneuver. It feels lightweight when you’re using it. It weighs 6o lbs. Diagram of the major components for the Husqvarna 5521P. The Husqvarna 5521P does an excellent job at collecting your grass clipping with a well-made collection bag. It does everything you need — it mulches, has a rear collection bag and has a side discharge chute. Also, a replacement for the Husqvarna 7021P lawn mower, which you can read about later in the article. Lift rear door of the lawn mower and place the grass catcher frame hooks onto the door pivot pins. To convert to mulching or discharging operation, remove grass catcher and close rear door. Rear door must be closed. Open mulcher door and install discharge deflector under door as shown. Mower is now ready for discharging operation. To convert to mulching or bagging operation, discharge deflector must be removed and mulcher door must be closed. The wheel height adjustment can be set between 1.25″ to 3.42-inches. 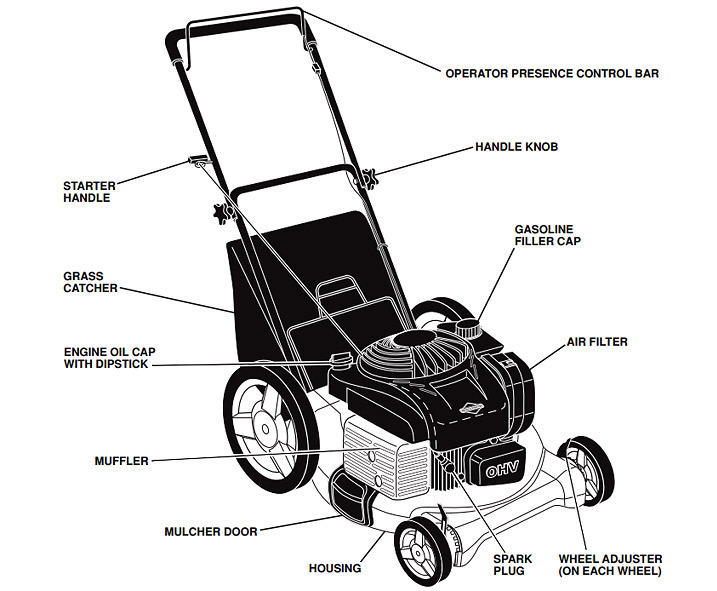 It has a 4-point, 5 position cutting height adjustment for varying lawn conditions. For colder weather, the Husqvarna 5521P has a primer that you simply push three times before trying to start. I’m confident in saying that the Husqvarna 5521P won’t let you down when you roll out of bed on Saturday morning to cut the lawn — or Sunday, depending on your preference for mowing. For the best results, Husqvarna recommends that you adjust the lawn mower cutting height so that the mower cuts off only the top 1/3 of the grass blades. The Husqvarna 5521P has a special mulching blade that recuts the grass clippings several times, reducing them in size so that as they fall onto the lawn will disperse between the grass blades, essentially disappearing. The mulched grass will biodegrade quickly, providing nutrients for your lawn. Overall, the Husqvarna 5521P is a ideal for most homeowners. To be honest, other than the few features that I’ve touched upon there’s not a lot to say because it simply works as expected. Nothing fancy but it will last you for years to come. An excellent value. Learn more about the Husqvarna 5521P from Amazon. View or download the manual for the Husqvarna 5521P push lawn mower. View or download the Spec Sheet to learn about the specifications for the Husqvarna 5521P. 140cc Briggs And Stratton 550EX Series 4-Cycle Engine. Overhead Valve (OHV) design. Runs cool while delivering more power. Super Lo-Tone muffler for quieter operation. 3-In-1 Mower Deck: Mulch, rear bag or side discharge. 2.5 cu. ft. soft sided bag. 8″ front wheels & 12″ rear wheels. Collection bag: 2.5 cu.feet / 70.79 liter. Large rear wheels make it easier to maneuver in tight spaces. Ensures mower rolls easily over all types of terrain. Husqvarna 7021P / 21-Inch / 160cc | Powerful, lightweight & well-constructed. Powerful 160cc Honda | GVC160 engine. Smaller collection bag: 2.2 cu.feet. Slightly heavier at 66 lbs. Simple, solid and ready to handle all your lawn cutting needs. Learn more about the Husqvarna 7021P from Amazon. View or download the manual for the Husqvarna 7021P push lawn mower. 160cc Honda GVC160 engine. Powerful and easy to start. 3-in-1 cutting system: mulch, rear bag, and side discharge. Extra large rear wheels capable of handling a variety of terrain & easy to handle. Adjustable handle for ergonomic operation. 4-point, 5 position cutting height adjustment for varying lawn conditions. Extra large collection bag makes this mower suitable for larger lawns. Double ball-bearing wheels ensure smooth operation and durability. Folding handle for quick and simple transport and storage.